I just got back from a trip to the Pryors and to the Red Desert Complex of south central Wyoming. The horses all look so fabulous and the Red Desert is horse heaven with abundant forage and so much room to roam. Maybe that is why the Congressional Public Resource Sub-Committee hearing today threw me for a loop! Here is that section of the hearing with Chris Stewart of Utah questioning and commenting to Secretary Zinke. This Congressional conversation bears no resemblance to what I am seeing first hand on our ranges. After I left the Pryors, I visited four Herd Management areas in Wyoming called the Red Desert Complex, areas scheduled for devastating roundups this fall. BLM proposes to remove over 2,000 wild horses. 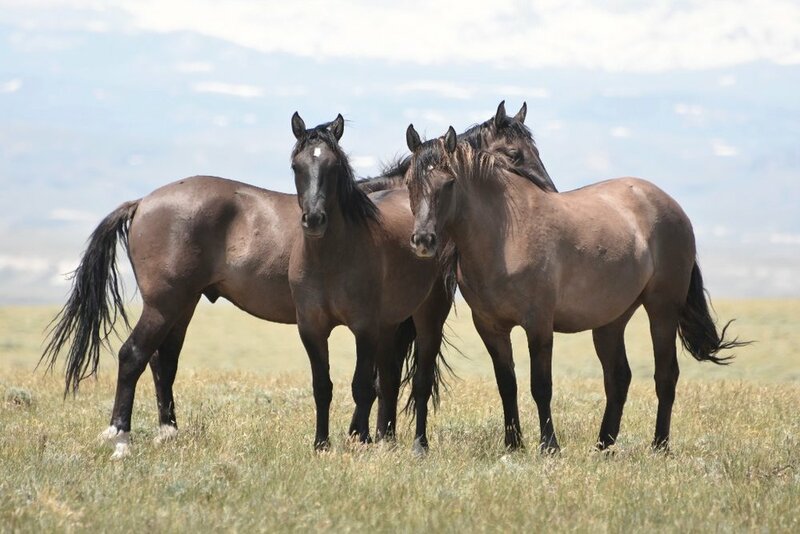 (Above; three grulla horses Crooks Mountain HMA) They would leave less than1 horse per 1,000 acres in the 750,000 acre Red Desert Complex! Congressman Stewart contends that wild horses are devastating western rangelands and starving to death. Here's what is devastating rangelands. I happened on this site while looking for wild horses in the Stewart Creek HMA. When I turned off the dirt road onto a two track the acrid smell of cow manure hit me like a slap in the face. Then I saw the cattle and the land around the pond. The area was devastated, not by horses, but cattle. The Secretary spoke of birth control methods that do not work. This too is completely inaccurate. PZP works in all the herds that use it but I can count those herds on the fingers of both hands. And Congressman Stewart chimed in that the cost was thousands of dollars (for a dose). The Secretary agreed. I feel like I am living in an alternative reality. PZP is $27 a dose and PZP-22 is a couple hundred dollars a dose---but thousands?! Where do these gentlemen get their information? It is critically important that you make your voices heard. The American public is the only thing standing between the death and destruction of our herds on the range and in holding. Please keep calling the White House and your Congressional Representatives and U.S. Senators and telling them that you want your wild horses to live in freedom on the range. Leave your name (spell it), and the town where you live. Give 2 or 3 short sentences on your explicit concerns for the preservation and protection of our wild horses and burros. Give your name again and express thanks for the opportunity to give comments. You will probably get a Voicemail—but that’s ok. These elected officials must understand how important this is to you, and phone calls are all logged. If 50,000 of The Cloud Foundation followers will call, that adds up to 200,000 phone calls to Washington DC! Thank you! Now let’s all get to work and make those phone calls for our wild horses and burros. Our work relies on contributions from those that love wild horses and burros and want to see them live out their lives in freedom on their home ranges with their families. If you can help us help our wild horses by making a donation today, please do so.